Create Harmonious Color Schemes with Ease! Color Wheel Expert is the most innovative and easy-to-use professional color utility application available. Designed specifically for web designers and artists, but user-friendly for anyone who works with color. 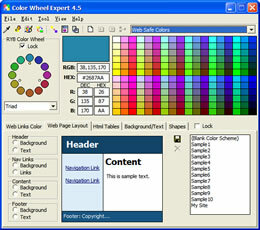 Color Wheel Expert runs on Windows 8/7/Vista/XP/NT/2000/ME/98. A single-user license is only $19.95 USD. You may download a free trial to discover how creating your color schemes just got a lot easier with Color Wheel Expert! "...If you don't have an eye for color combinations then please don't combine colors on your own. I'll be using this tool in my future HTML (and image) endeavors, for sure. Isn't it nice when someone comes along and creates something you didn't realize you couldn't live without?..." "Your product is the best I've seen that allows students who are learning the basics to mess around palettes and instantly see their results." "After downloading and trying your product I was impressed enough to buy it. After trying the full version I was impressed enough to recommend it immediately to two friends who do design work. After receiving this e-mail I am a raving fan of your company and will highly recommend your product and company. Keep up the good work!" "A great tool for our creative graduates from Online High School Diploma to use!"